Car essential to get around. No dogs allowed at any time. £50 non refundable deposit required by bank transfer to secure booking. Balance to be paid in Cash on arrival. If you are looking for a tranquil break then Turnberry Caravan Park is the place for you. We Have a luxury two bedroom caravan with televisions in both bedrooms,lounge dining area fitted kitchen with integrated appliances. Double glazed, central heating. All beds will be made up for arrival, and cleaning material's all provided. Hirers are required to bring their own Towels. We have a small club/restaurant and cafe on site which provides entertainment at the weekend also bingo. During Mid to High season there is children's entertainment supplied by the park. At the entrance to the park we have the Downhill farm shop and restaurant which is very popular. Girvan Beach is approximately 4 miles from the site where there is a new swimming pavilion, we are also close to the Trump Turnberry hotel and Golf Resort where if you would like to have a round or two of Golf you can enjoy a visit to the resort. There is also nice restaurants at Maidens which is about three miles from the park. There is also a great golf course in girvan which is very popular with caravan owners. Ayr is also nearby and is also a nice day out where you can go to the farm park with the children. This park is peaceful and very friendly. If you are into your Walking, Cycling or Hill Walking then there are some beautiful walks in and around the area which you can explore and enjoy the outstanding scenery. There will be a Welcome pack waiting for you on arrival which will allow you to enjoy a nice Tea or coffee when you arrive. Local Amenities include an Asda store in Girvan for your shopping. You will be met on arrival and will be shown round your accommodation as to how the heating etc works. Whether you want a week or a long weekend break to chill and relax this is the place to be. Additional Info: Club, Shop, Café, Restaurant, Laundry room with dryers, swimming pool and Suana. Laundry room machines require Change so please bring plenty of change if you plan to use these facilities. We just returned after an excellent weeks holliday. Nan was so welcoming when we arrived she had made a welcome pack, got in milk and was so nice. She put me in mind of my aunt and was just as kind. Her caravan was immaculate and had everything u could ever want and need in a caravan. It was more like a home from home. There’s chair out on the patio area an u can see the ocean. It was great 2 sit and just relax and see the ocean in the day and the stars at night. The park is family friendly but not 2 busy or noisy. Best of all there a WiFi signal an it’s free which was great 4 me as my kids r 13 & 17. We all had a great time ma husband said it was the most peace he’d had in yrs. it was perfect thanks man 4 everything. We’ll definitely be in touch again. We had a very enjoyable week staying in this lovely caravan. Nan and her husband were very welcoming and the little goodies pack was a very pleasant surprise. 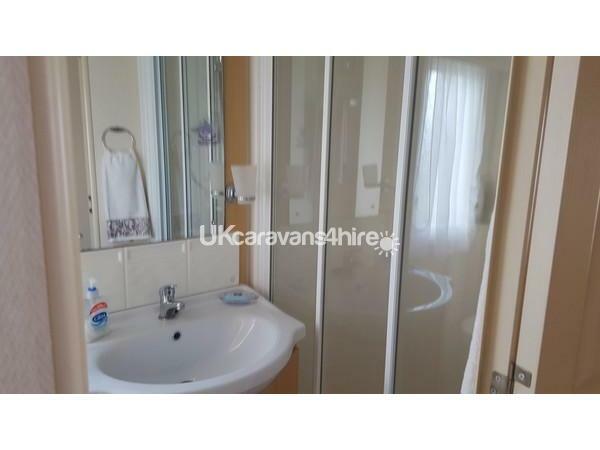 The caravan had everything you could want for a relaxing holiday and was spotlessly clean. The weather was not kind to us during our stay so it was particularly nice coming back to a lovely home after our day out walking or cycling. All in all a perfect welcome and a beautiful caravan. Highly recommended.